By using a sales funnel, cold leads can be effectively “warmed up” before they receive a pitch for your offer, causing prospects that initially would reject your product to become loyal customers who are even willing to refer your products to friends or talk about your brand on social media. By attracting the right people to your brand and engaging them with content that increases their trust in your brand, you can increase the number of total conversions, improve the conversion rate on your offers, and possibly decrease the cost of conversion—all the “good stuff” you want to do for your business. Before we show you how you can set up the perfect sales funnel for your business, let’s go over some of the most common mistakes you’ll want to avoid. A good sales funnel can drastically improve the chances of converting leads into sales, but your outputs are still limited by your inputs. Make sure that you’re targeting the right audiences when you’re looking to bring people into the top of your funnel; it will save you lots of time and money. We’ll cover how to do this in the “Research” and “Traffic” sections of this guide. 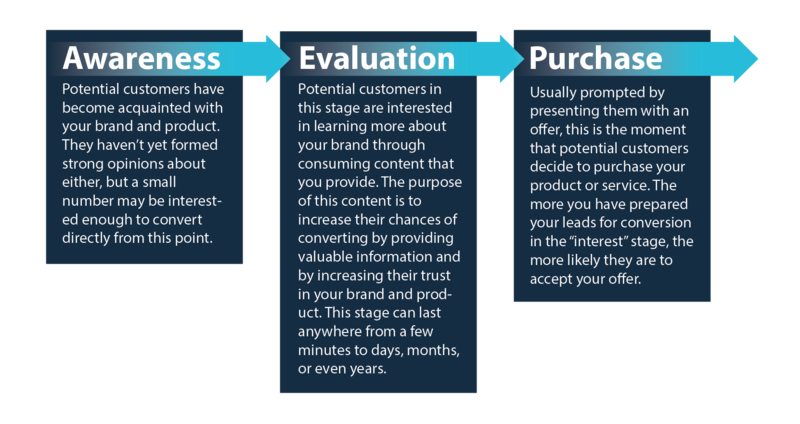 Once your audience is in the “evaluation” stage, you must guide them through to the “purchase” stage in a way that will maximize the conversion rate and minimize the dropout rate. How you do this should be customized according to your industry, your audience, and your product. Every situation is different and requires you use the right timing and the right types of content. We’ll show you how to choose the right content to prepare your leads for conversion in the “Engagement” section of this guide. After spending all that work attracting and warming up your leads, don’t push them through the decision stage with a poorly optimized landing page or e-commerce checkout sequence. To get the most out of the groundwork you’ve laid, make sure you pitch to the leads that are ready to convert on a platform that is best suited to your audience and your product. We’ll go over how to do this in the “Conversion” section of the guide. 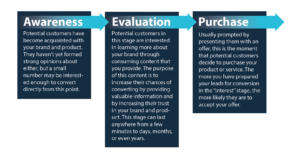 Research – This step lays the foundation for your sales funnel. By researching your market and identifying your ideal customers, you can build buyer personas that will help you choose the best strategies for the remaining three steps. 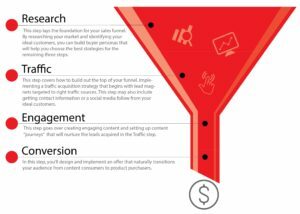 Traffic – This step covers how to build out the top of your funnel. Implementing a traffic acquisition strategy that begins with lead magnets targeted to right traffic sources. This step may also include getting contact information or a social media follow from your ideal customers. Engagement – This step goes over creating engaging content and setting up content “journeys” that will nurture the leads acquired in the Traffic step. Conversion – In this step, you’ll design and implement an offer that naturally transitions your audience from content consumers to product purchasers. Before you design an ad or draft your first piece content, you first have to understand who your ideal customer is and how your product fits them. This first step is critical to the overall success of your sales funnel because it sets the roadmap for the entire process. Well-crafted buyer personas can help you determine what sources you should draw from to attract your initial leads that will go into the top of your funnel. They also give clues as to what content will best resonate with potential customers or resolve the concerns that will prevent their conversion into buyers down the road. Another benefit of market research like buyer personas is that they can help you to segment your sales funnel, allowing you to customize your marketing strategies for different subsets of your main audience. Sometimes it’s best to just directly ask people for this information. Start with what demographics you know to find a good survey audience. Many survey-providers, such as Survey Monkey and Survata, allow you to pay to access their roster of survey-takers. They also support selecting your audience based on common demographic factors—like age, gender, or profession. If you already have an audience for your product, such as an email list or social media following, you can send them surveys to further flesh out your buyer personas. Take note that when you draft your survey questions, make sure you avoid questions that will introduce bias into your results or that may be easily misunderstood. Governments, companies, and nonprofit organizations regularly carry out research that is either available for free or for a fee. Census data, opinion polls, and industry reports can provide valuable insight for your buyer personas. For free sources of market research, try sites like https://www.statista.com/ or https://www.thinkwithgoogle.com/. This kind of research requires that you know a little about your target audience, but it’s incredibly useful for improving a buyer persona that could benefit from more detail. To do this kind of market research look at what people in your target audience are reading online and sharing on social media. For example, find where people in your target audience discuss things online—places like forums, Facebook groups, or Reddit. Take a look through the most popular posts or the most discussed topics to see what your ideal customer is concerned about and interested in. Use this information to round out your buyer personas and create content that is customized to their needs. Remember that as you get the results of your efforts marketing to the people in your funnel, you’ll get valuable data about what does and doesn’t work. Use this to tweak and hone your buyer personas as you go along to constantly improve and keep up with any demographic shifts or changes in preference your audience may undergo. Sometimes, you may even find that there’s another, even better audience out there for your product that you only discover during the later steps of your funnel through trial and error. Don’t be afraid to act on this new information. Now that you have a good idea of who your target audience is, it’s time to draw them in through the top of your funnel. First, you’ll need to decide on which source or sources of traffic will bring in leads that are most likely to convert. Direct Traffic – Site visits that come from someone typing your website address into the URL field of their web browser. New visitors who land on your site through this method usually hear about or see your website address offline, such as by word of mouth, on a business card, or from a billboard. Referral Traffic – Visits that come from links found on other websites are referral traffic. These links are also called backlinks and can be found in blog posts, news articles, social media posts, and more. You can get more referral traffic by doing things like outreach to other websites, maintaining a social media presence for your business, or getting published on review sites. Organic Search Traffic – This is any traffic that comes from visitors who click on your site from within a search engine’s organic (unpaid or earned) search results. To increase the amount of traffic you get from search engines, you can do search engine optimization, or SEO, which involves making it easier for search engines to find your website and creating content that is more likely to rank higher in search results. Paid Media Traffic – This kind of traffic includes all visits that come from online advertising. This includes search engine advertising (Google search ads), social media advertising (Facebook, Instagram, Linkedin, and Pinterest ads), display advertising (banner ads), and video advertising (Youtube pre-roll ads). These four types of traffic could be simplified into two main types of paid and unpaid. Each has its own advantages and disadvantages. Unpaid traffic is, as you can tell by the name, free of advertising costs. And specifically in the case of search engine traffic, the traffic brought in is relatively consistent month to month, sometimes even year to year. The main drawback is that referral traffic, direct traffic, and search engine traffic can take time to build up momentum—referral traffic requires enough sites to link to you, direct traffic requires time to build up your brand’s word of mouth buzz, and search engine traffic sometimes needs months of work for your site to achieve a sufficiently high ranking. For those who don’t have time to wait for unpaid site visits, paid traffic offers immediate results, as long as you’re willing to open your wallet. The cost of paid traffic typically increases in proportion to the amount of traffic it brings in, which makes it very easy to ramp up or down according to your budget, sales goals, or amount of inventory. Sometimes communicating the benefits your product provides is enough of an incentive to get people to immediately purchase it, but this bypasses the top and middle of the sales funnel and only converts a small portion of your target audience. To bring in a wider pool of quality leads, you’ll need a way to entice people to enter the top of your funnel. This can take the form of a discount, free shipping, exclusive content, or access to an online tool. All lead magnets are the same in that they provide real value for your target audience in exchange for the opportunity to engage them in the middle of your funnel. Your choice of lead magnets should be closely related to your product or service to ensure that you’re attracting people into your funnel who are likely to convert at the end of the engagement step. Direct Traffic – Hand out flyers at a trade show for your industry. Along with your product landing page’s URL, include a promo code that customers can enter to get a free product upgrade or add-on. Referral Traffic – Create a special link that a referring website can direct their users to click on. This link allows them to receive a discounted price. A portion of the sales can also be given to the referring websites (a practice known as affiliate marketing). Organic Search Traffic – Create a how-to guide that is relevant to your product and optimized it for search keywords in your brand’s niche. You can follow up with a prompt to join your email newsletter at the end of the article. Paid Media Traffic – Write an article that explains some of the changes happening in your industry and mention your product somewhere in the article. Link to it in a Facebook post and advertise it to people in your target audience. The possibilities for using lead magnets are endless. The key is to find the right combination of lead magnet and traffic source that will bring in enough visitors who are willing to be engaged by your content and eventually convert. Now that you have traffic, you can begin to prime your site’s visitors for conversion with engaging content. The first instance of engagement with your brand will happen when they consume the content within your lead magnet, so make sure that it’s more than just a catchy headline or an interesting concept. Some of your leads will be ready to convert after clicking on your lead magnet. The rest need to be willing to receive more of your content that will prime them for their eventual conversion. The only way to make this possible is to keep creating content that has real value for your target audience and to deliver it to the people who have entered into your funnel during the traffic stage. Your audience is unique. Make sure your content suits their needs and interests. The more you can focus your content on your target audience’s preferences, the more likely they are to continue through your funnel. It may be tempting to save time by throwing together a short blog post as fast as you can, but content that engages must be well-researched and carefully executed. Your audience will feel confident buying your product or service when you demonstrate your credibility in your industry, but you’ll lose their trust if you include information that isn’t accurate. Some marketers will gate their best content behind a subscription or one-time purchase while posting short excerpts as “teasers.” No one likes a tease, so don’t be one. Give your best content away for free. Create something that your target audience will actually learn and benefit from, without expecting a transaction from them. If you have the hardware setup and available time, regular video and podcasts content can be a great way to engage your prospects. One key to a successful podcast or video series is to make sure that you release episodes on a regular basis, otherwise, your subscribers will begin to lose interest and eventually hit that “unsubscribe” button. Social media can still be a great way to keep in touch with prospects, but choosing the ideal platform is critical to your success. Make sure you use the buyer personas you built in the research stage to determine what social media platform your ideal customers use, as well as the kinds of content they are most likely to consume on that platform. It’s one of the oldest ways to distribute content online, but it can still be a valuable part of your engagement strategy. The classic email newsletter is still alive and well, but you’ll have to make sure you don’t get caught in your prospect’s spam-blocking robots. Humans don’t like spam either, so it’s critical to create emails that will be actually opened, read, and responded to favorably. The most technical engagement method on this list, retargeting can be a great way to reach prospects who have visited your website or clicked your ads but haven’t given you their contact information. It involves using cookies to send targeted advertising to unconverted site visitors with ad platforms like Facebook advertising or Google Display Network. Your leads have now progressed through your funnel to the point where they are ready to convert. But how do you get them to make that last step from the middle of your funnel through to the end of the conversion stage? The answer is finding the right conversion transition. Throughout the engagement stage, you’ve been creating high-value content for your target audience that has educated, entertained, and enlightened them. You’ve built up their trust in you by being generous with your content. The challenge now is to pitch them your offer without betraying that trust. The key is to keep the focus on value and relevance. Just like the valuable content you’ve created that has benefitted your target audience, your product should also clearly be valuable. Your offer should also be relevant to the content that contains it or precedes it. Let’s take a look at a few examples of what this looks like in a real digital marketing campaign. Blackmilk is a fashion brand that sells printed leggings, swims, tops, and skirts. The majority of their marketing is done through Instagram, where they have built a following of over 1 million people. 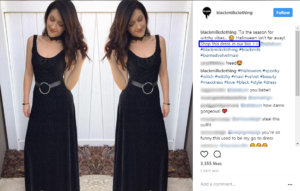 Most of their posts show a model wearing one of their newest or upcoming designs. 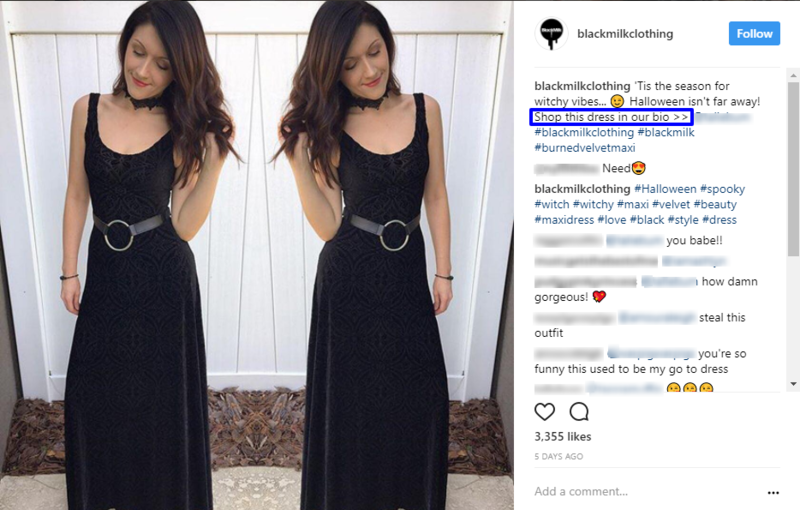 In this example, you can see how Blackmilk transitions their followers out of the engagement stage with an offer to purchase the very product shown in the post by clicking on the profile link. In this blog post, Slidebean shows the pitch decks that successful startups have used to secure funding. 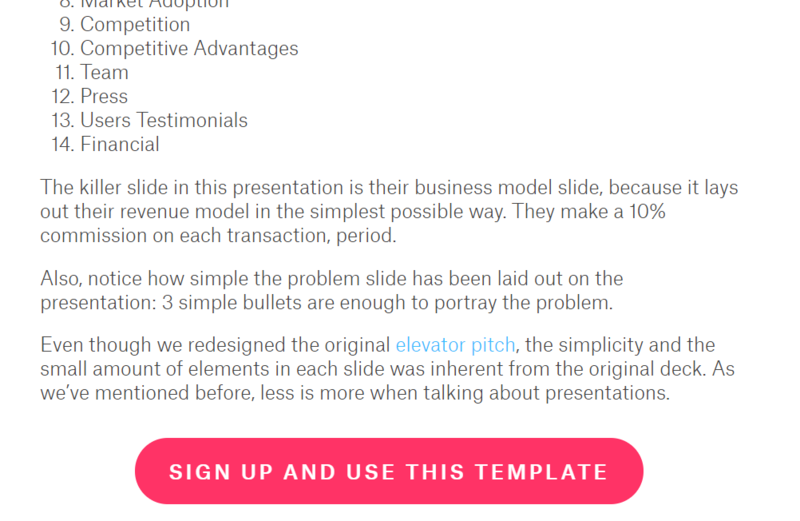 Instead of just explaining how to recreate these startup’s success, they go the next step and integrate their offer into the content by prompting users to sign up and get access to a Slidebean template based on each startup’s winning pitch deck. This provides even more value to readers and couldn’t be more relevant to the content they’ve just read. In his daily emails, Josh offers advice on how readers can achieve their goals of becoming thought leaders. At the bottom of a recent email, he included this section offering access to exclusive content Influence Summit 2017. 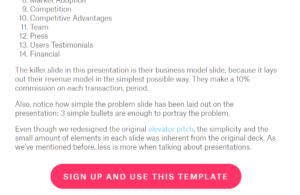 He offers relevant value to his readers with the short pitch shown in the image below by tying the offer to the context of the email’s overall message. One of the most common places to purchase something online, e-commerce stores come in all sizes, from online megastores like Amazon, all the way to niche websites that sell a single product. If possible, make sure you make your conversion transition go to a specific product page that is most relevant to the content it is placed in or proceeds. This reduces friction and allows you to tailor your offer to the audience that is most likely to convert. The humble landing page is the bread and butter of many single-product businesses. These one-page sites typically only provide one action for visitors take, which helps keep friction to a minimum. The best landing pages provide everything potential customers need in order to feel comfortable converting. Although this is a more hands-on approach, an email pitch can be a great way to get conversions in industries that sell very expensive or very personalized products and services. Make sure it’s clear that anyone who responds to your pitch or sends a request for more information will get a personal response. This helps resolve any concerns that their email will get overlooked or forgotten. These are the most low-tech ways to seal a deal, but they can be extremely effective, especially for local businesses or big-ticket contracts for consulting and other professional services. The key takeaway for making these methods work is to make sure your leads have been very well-prepared for conversion by your funnel. Otherwise, you’ll become well-acquainted with the main drawback to telephone and in-person appointment selling: the huge amount of time they can waste if you don’t make the sale. 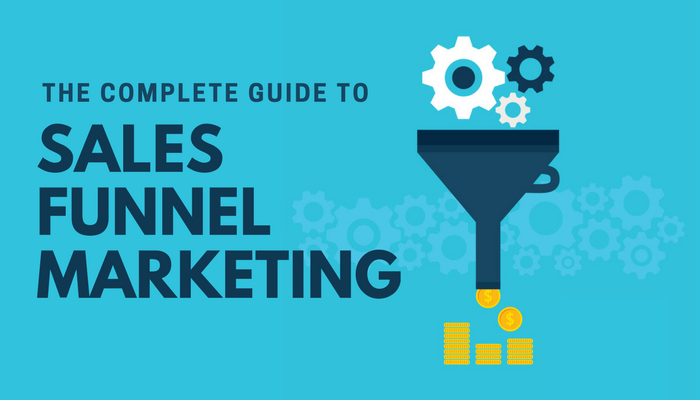 Although this guide should give you a solid foundation on how to build a high-converting funnel for your business, there’s no substitute for real-world experience. The best way to get started is to build something simple. Over time, you’ll recognize what works, what doesn’t, and what needs adjusting. As you spend time working on your funnel, you’ll find ways to get a better idea of who your ideal customer really is, improve your traffic generation, expand your engagement content, and optimize your conversion process. So what are you waiting for? Get started on your sales funnel now! P.S. If you’re interested in jumpstarting your sales funnel creation with some help from the experts, reach out to us at MWI. We’ll work with you to create a customized growth strategy that includes building out a sales funnel centered around your business’s unique needs.